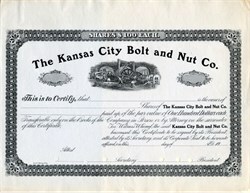 Beautiful specimen certificate from the Kansas City Bolt and Nut Co.. This historic document was printed by the Jos. S. Christy Company around 1900 and has an ornate border around it with a vignette of a group of men working at a foundry. Bristol St., Kansas City, Mo. Org. and inc. Apr. 7,.1887. Capital stock: $500,000. M. D. Sternbergh, P.; at Reading, Pa. Solomon Stoddard, V. P. & G M.; J. Hervey Sternbergh, Sc. ; H. R. Warren, T. & P. A. ; D. D. Neville, G. S.; C. A. Johnson, G. S. M.; at Kansas City. Works at Kansas City: blt. 1887-88; f. o. Jan., 1889; 4 heat. fur. (4-d.); 2 trains (16" & 10" comb. 3-h. 7-st., 10" 3-h. 5-st.); 2 ham. (1,500 and 800-lb.). Fuel, oil. Machine shop for own use. Boit and nut factory. Car forging and blacksmith shop. Product: merchant bar and boit iron; reinforcing bars; boits W to 3"; hot pressed nuts, 1A" to 3"; rivets W to 3"; spikes; lags, rods, boat spikes, railroad forgings, silo hardware, oU well supplies, structural forgings, pole steps, cross arm braces, turnbuckles, hooks, eyes and stubs. Annual cap., 40,000 tons of bar iron, 150,000 kegs boits, 50,000 kegs nuts, 3,000 kegs rivets, 12,000 kegs of forged spikes and 5,000 tons of other products.